It’s that time again: the air is colder, the days are shorter and everyone throughout Manhattan, is in a gift-giving spirit. And what’s a better gift for the film buff in your family than a customized home theater installation? Our Immersa home theaters are designed to be the perfect escape for every movie lover at any time of year, and they’re completely tailored to reflect your individuality. But there are some aspects of an installation that are simply essential for getting full enjoyment out of your experience. 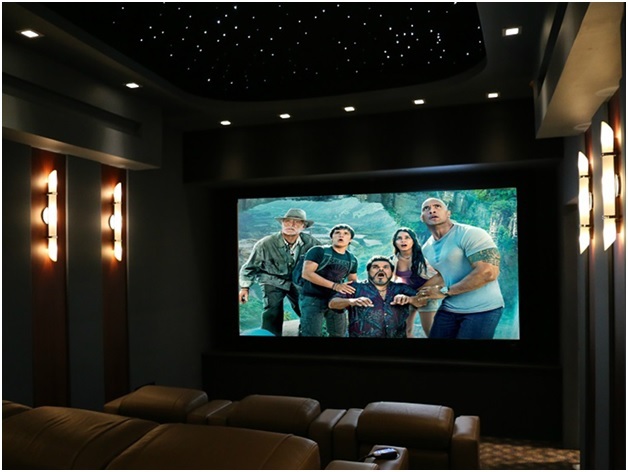 This blog will take you through some of the home theater basics. One of the most frequently overlooked aspects of a successful home theater installation is the seating. In fact, it should be one of the first decisions made. Both the placement and the style of the seating can greatly affect the look and feel of your movie-watching experience. Plenty of homeowners opt for a big comfy couch – a great choice for bringing the family together. But if you want the best performance out of your Immersa home theater, you’ll need comfortable, customized theater seating. Not only are theater chairs designed ergonomically for comfort, but they are also designed to enhance your listening experience. Where you place the seating determines how big the screen can be, and where to place the speaker components for optimized sound. Making these decisions early is important for the best picture and sound quality. For a few years we’ve been hearing the same thing: 4K is the wave of the future. Well, that’s no longer true. Ultra HD is here, and if you want the best look in your home theater, you’ll want to have a crisp-looking 4K projector. Take for instance Sony’s latest–the VPL-VW520ES. Not only does it offer pristine 4K picture, but it’s also the world’s first high dynamic range-capable projector. HDR is a relatively new format that enhances the range of visible colors in a digital image, adding a previously unseen level of detail. It’s the next step in image quality, and when 4K Blu-rays hit the shelves early next year, your home theater will be ready. Even if your theater has the most advanced image capabilities, it won’t feel like a real private cinema without a quality immersive audio system. Immersive audio, also known as 3D audio, is a completely new way to listen to your favorite movies. Formats like Dolby Atmos are already used in movie productions and commercial theaters, so why not have that same level of sonic sophistication in your home? Atmos almost totally overhauled the way movie soundtracks are mixed and played back. By isolating sound objects (that’s each sound you hear) and arranging them throughout a scene in a realistic way, sound is now able to move in front of, behind and even above you. This creates a three-dimensional soundscape around the viewer, leading to a whole new listening experience. In most cases, the darker the theater, the better the image. Today, modern technology like high-contrast screens and ultra-bright projectors mean your theater doesn’t have to be pitch black to enjoy a movie, but lighting control is still essential. Imagine being able to lower the lights, turn up the sound and start a movie with the touch of a button. That’s completely possible in an Immersa home theater. And if anyone wants to get up and fix a drink at the bar, you have complete control over individual lighting zones, so you can light their way without disrupting the movie. Plus, you can add in-floor lighting along the ground to help guide you to your seat, and LED backlighting for a splash of color that doesn’t diminish the picture. If you want to get the full Immersa experience from your Manhattan home theater installation, contact us today!